The player, survivors attempting to escape from Afurekaeru London zombie. Or combined sight as the scope, or open the door, and to view the map, active in various situations. We do our best for you!! New weapons, skill sets, and playable characters including Hunk, take the Raid Mode experience to new depths. Resident Evil Revelations features series favourites Jill Valentine and Chris Redfield, plus their respective BSAA partners - Parker Luciani and Jessica Sherawat. New weapons, skill sets, and playable characters including Hunk, take the Raid Mode experience to new depths. Resident Evil Revelations features series favorites Jill Valentine and Chris Redfield, plus their respective BSAA partners – Parker Luciani and Jessica Sherawat. Biohazard Revelations (Japanese version of Resident Evil). Brand New, Still Sealed! Ships from United States! Game will only play on Japanese consoles. Feel free to ask any questions you may have. PAL UK ENGLISH VERSION . This will NOT work on NTSC Consoles . Project Zero Maiden of Black Water. Here we have a Used but tested in working condition item as shown. 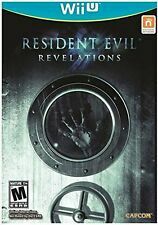 Title: Resident Evil: Revelations /Wii-U. Missing Information?. Zombi U - Nintendo Wii U. What you see in the photos is what you get. No playing around, nothing hidden. Honesty is the best policy. Genre: Survival Horror. Used / Very Good Condition. ALL OTHER INFORMATION. 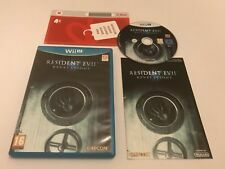 Resident Evil Zero - Nintendo Wii / Wii U - PAL - Free Fast P&P! Nintendo Wii / Wii U. Resident Evil Zero. It is used and c omplete with manual. Disc has light scratches from usage. 5 out of 5 stars - Resident Evil Zero - Nintendo Wii / Wii U - PAL - Free Fast P&P! 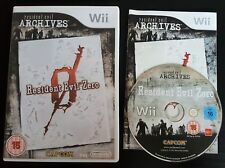 1 product rating1 product ratings - Resident Evil Zero - Nintendo Wii / Wii U - PAL - Free Fast P&P! Genre: Survival Horror. Used / Very Good Condition. ALL OTHER INFORMATION. Cover Insert. Resident Evil Revelations features series favorites Jill Valentine and Chris Redfield, plus their respective BSAA partners - Parker Luciani and Jessica Sherawat. With limited ammo and weapons available, the race is on to survive the horror of Resident Evil Revelations.